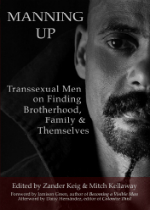 Manning Up: Transsexual Men on Finding Brotherhood, Family & Themselves is an anthology of personal narratives by trans men in North America, spanning an array of perspectives, ethnicities, classes and ages. This anthology provides a space for trans men to share their experience of childhood, coming out, transitioning, relationships, family and what masculinity means to them. The book comprises four sections – Manning Up, Family Man, Men Like Me, and New Territory. Although many of the themes explored in the anthology are similar because of the nature of the subject, each author puts their own mark on it. There are some stand-out pieces such as “Sculptor” in the Family Man section by Willy Wilkinson, in which he compares the transitioning process to that of whittling away at parts of himself, and sculpting his masculinity not only by his own hand but feeling the influence of his father and grandfather before him. “Sculptor” is a highly evocative piece, poetically crafted to become not just a coming out story or a transition story, but a piece of art. 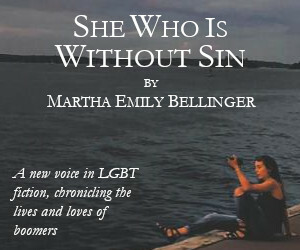 This anthology is not just for trans men, but will resonate for many in the LGBT community as our coming out, growing up, and self-exploration changes continually as the world around us changes. This is an attractive collection that would be a valuable addition to writers, students and teachers. Manning Up can be dipped in and out of over time, not requiring the reader to consume the entire text in one sitting, and the narratives work well as stand-alone pieces. I look forward to the next set of anthologies that books like Manning Up are opening space for–tales not just of coming out and testosterone but of post-transition and beyond. Manning Up is an important collection for the trans community and for literary culture and will likely inspire future generations of trans people to write, share, and create with pride. Thank you, Jackson, for such a glowing review of Manning Up! I am so honored to receive letters from trans men telling me how impactful the book has been for them. No problem! 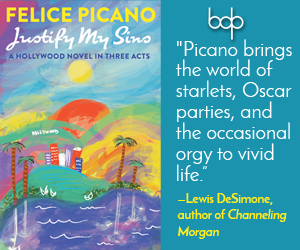 It’s a real pleasure to review trans books and spread the word. Look forward to reading more from you.